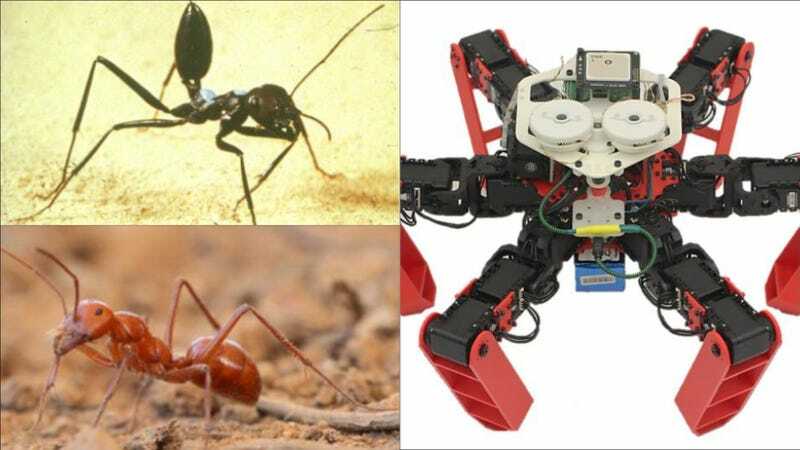 Top left, a Cataglyphis desert ant; bottom left, the Australian desert ant Melophorus bagoti; right, the AntBot. The AntBot in its full glory. Ants’ compound eyes, for instance, contain unique photoreceptors that capture ultraviolet light from the Sun that’s become polarized by scattered air molecules. This pattern of UV light, however, changes as the sun moves across the sky. By tracking these shifting patterns, the ants essentially have an internal, celestial compass that lets them determine which direction they’re facing. The same technique might even have been used by Viking sailors in the sea to navigate on cloudy days. They can also track how fast the ground appears to be moving across their eyes, which is known as optic flow (next time you’re in a car or bike, for example, just pay close attention to how the world seems to be moving past you—that’s optic flow). Optic flow, along with the ants’ awareness of how many steps they’ve taken during a walk, allows them to estimate how far they’ve traveled. Put that together with the celestial compass, and you’ve got a living, breathing homing device with six legs. The AntBot’s journey back home, sped up six times. Originally, he estimated, it could have cost upward of $85,000 to create a bot with an array of sensors that mimicked the ant’s compound eyes completely. But the bot’s less-complex sensors were still able to replicate the unique photoreceptors used for the celestial compass; they also helped drive down the final cost of designing and producing the AntBot to around $500. The navigational knowhow displayed by the AntBot could someday be put to good use in technologies like last-mile delivery drones or smart cars, Dupeyroux said. Ideally, these robots would use a combination of different methods to navigate on their own, including GPS. But the AntBot’s bag of tricks could provide some advantages over existing methods in certain situations. The team also plans to upgrade the accuracy of the bot’s celestial compass, as well as its processing power.